I was busy in the kitchen tinkering with my camera when I noticed Stanford pacing briskly back and forth out on the deck. He click-clacked his way up and down the beaten wooden planks and appeared enchanted by something in the old Redwood tree. It must be his new friend, I thought. Or his new foe — the squirrel who’s built a nest of sticks and twigs perched on the tree. He poked his handsome head between the railings and prepared to lunge at the frolicking squirrels. Stanford has a propensity to run with reckless abandon toward anything that catches his fancy. You should see him in the park when he chases after his ball or in his walks when he spots pigeons on the street. 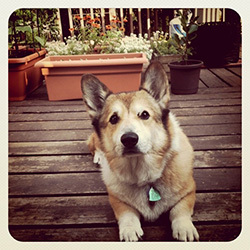 Never belittle those short corgi legs for he can run like the wind. That morning, he was determined to run after our beguiling little neighbors. I rushed outside, grabbed the little guy, and calmed him down. Nobody wants a squirrel scuffle. Nobody wants anyone to get hurt. Soon the morning ruckus quieted down. All I could hear were the ducks quacking in our neighbor’s yard. The ducks, mind you, aren’t a bad thing. They are actually a hoot! They don’t quack incessantly, thank heavens, but when they do they’re hilarious. I sank back into my Adirondack while Stanford retreated to his favorite spot next to our Early Girls. A gentle morning breeze blew from the south and I caught a whiff of the fragrant calamansi blossoms. We had lost all hope that they would bloom again but after we read about and tried starving the tree of water until its leaves roll up then adequately watering it, we saw a full flush of blossoms within a month. The tree looked magnificent with a flurry of white citrus flowers. I leaned back and marveled at how much our edible garden has grown. We started with pots of basil, mint, parsley, rosemary, and thyme over a year ago and we’ve expanded our repertoire to fill every possible square footage of space in our yard that gets ample sun. Dennis has done a remarkable job putting it together. Why care for an edible garden? We don’t fit the bill of hippie-urban-farmer-types, you know. I seriously doubt we can reduce our carbon footprint by caring for a garden as tiny as ours, even if every little bit helps. I also doubt we can save a real, big chunk of change by eating food sourced at home. But gardening is something both our moms did when we were little. It reminds us of home. Papaya and guava trees in Manila. Tomatoes and zucchinis in Ohio. And it’s the sheer delight of seeing things grow. The delight of seeing tomatoes ripen and pea shoots curl up. The delight of seeing fragile dill leaves form and ruby-red beet stems grow. Plus it’s the unquantifiable sense of pride that the radishes pickling in vinegar and the tomatoes simmering in butter in our kitchen didn’t come from far, far away. They were homegrown and hand-picked from our own edible garden. 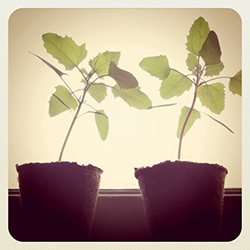 You’ll be amazed at how much you can grow even in tiny, cramped spaces. 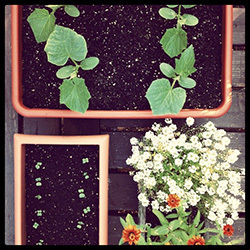 There’s so much information out there both in print and online that you should give an edible garden, however small, a try. Here’s a list of books and links that we’ve found most useful. Would You Pay $150+ for Year-Round Fresh Herbs? 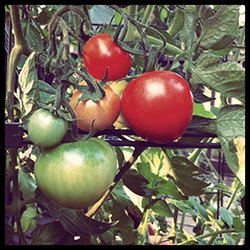 By the way, we wouldn’t have the impetus to start growing tomatoes and radishes if it weren’t for Annapet and Melissa. Thank you for the inspiration. Care to share your own gardening story? Combine vinegar, sugar, and water in a saucepan and bring to a boil, stirring to dissolve the sugar. Remove from the heat and let cool to room temperature, then chill in the refrigerator. Put the radishes in a canning jar or other storage container and pour the pickling liquid over them. Let stand for 20 to 30 minutes, then cover and refrigerate for up to 1 month. 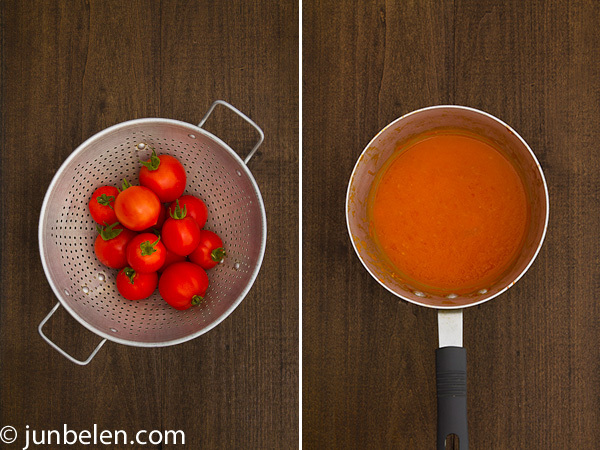 Plunge the tomatoes in boiling water for a minute or less. Drain them and, as soon as they are cool enough to handle, skin them, and cut them into coarse pieces. Taste and correct for salt. Discard the onion before tossing with pasta. Serve with freshly grated parmigiano reggiano cheese for the table. Isn’t growing edibles fun? Quite infectious, too ;-). My pair of dwarf calamondin trees got really ugly and yellow from too much water. They are recovering and flowering to boot! Funny you mentioned ducks. We have a town meeting about allowing chickens in Corte Madera. This is such a great post, Jun! 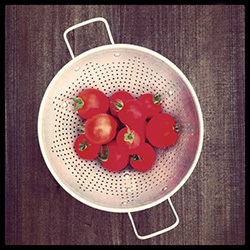 I love to pickle veggies and this tomato sauce recipe looks good. Must try all these soon. Thanks for sharing! You’re very welcome, Annapet. Thanks to your tomato planter I lugged on Muni we’re growing and picking our own tomatoes. Thank you! Thanks for a lovely post, Jun. I agree…there is so much deliciousness to be grown that evokes the flavors and feelings home. Maintaining connection to plants and our food, even in cramped urban spaces, is so much more than a gesture or a practicality. It feeds the soul. Sharing a gardening story…I first got into the garden as a 7-year-old living in the Mojave Desert, before our family moved to the Big Island. 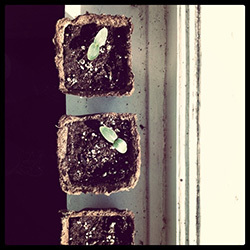 I had just read “The Secret Garden” and obsesssed over the idea of planting a little piece of earth. Luckily there was a spot in our yard I could take over, so I spent most of the summer planting and watching over thyme, sage, sunflowers, and a rainbow of desert wildflowers. Nevermind that the corn only grew to one foot tall and the carrots stayed skinny as a pinky finger in the poor soil. The garden taught me the beauty of coaxing something edible from the soil. 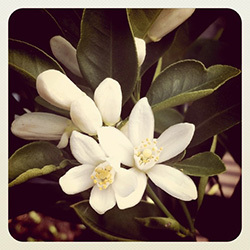 lovely calamansi blossoms. Bebe Girl aka Celine likes! Oh Aileen, thank you for your wonderful note and your childhood story. I didn’t know you grew up in the Mojave Desert. I’m sure the carrots were a lot bigger in the Big Island! One of our loft, lofty goals in life is to own a bed and breakfast in Hawaii with a sustainable farm attached to it. Imagine all the papayas, guyabanos, and calamansi we could harvest there. 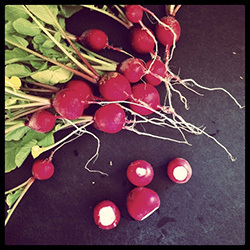 But for now, we’d have to settle for these cherry-red radishes, which aren’t bad at all. Looking forward to your graduation in Santa Cruz! 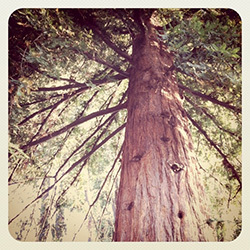 Your images are so gorgeous, and reading your garden tales makes me wistful for the backyard we used to have. Our garden now is out of sight, a 5 minute walk away, as well as a bunch of planters on our deck where we’ve planted dahlias and a ton of herbs. We’re battling aphids there and slugs and snails in the garden plot, which can be really frustrating. But the satisfaction of growing your own vegetables – even if it’s only enough for one or two salads – is totally worth it. Can’t wait to check out your little garden sometime!! kaganda ng photos! 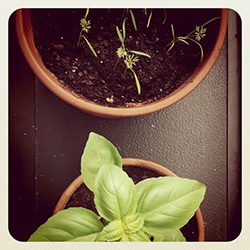 I would love to grow my own herb garden in our tiny flat. I just hope it can stand extreme weather here in Dubai. Salamat, Abigail! Does it get really hot in Dubai? Calamansi trees love the heat. Pandan and lemongrass, too but it may be too hot, no? A lovely concoction and recipes. Have bookmarked them and will try for sure. thanks ! Summer (June-September) temperature could reach 40C + humidity of 75 to 80 percent! I’m scared to bring some pandan and lemongrass root from Pinas. Hoping my seeds grow well as we enter a much nicer weather. Nice! Pogi talaga ni Stanford! Stanford, would you like to see my little garden of siling labuyo, okra, ampalaya and tomatoes? 😀 Wala kaming sosyal na radish sa Bataan eh! I am in love with your edible garden! 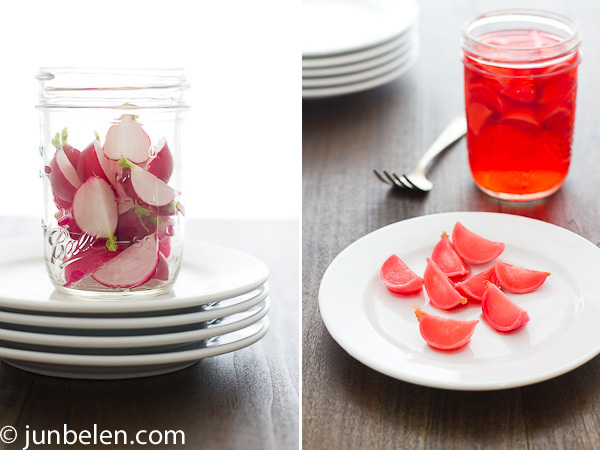 And I think great minds must truly think alike – I just posted a recipe today for pickled radishes, I am OBSESSED with them. They are so good, and could anything be more simple to make? 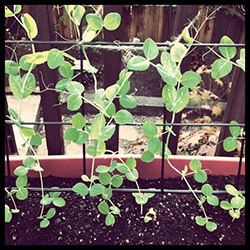 Thanks for sharing your great photos and garden. Jun – love the story and just want to hug little Stanford. These radishes look and sound amazing. A must try. Fab photos!!! I have no gardening story. Oh wait I have one. So we had a tiny little garden plot at Family Student Housing at UCSC and my son wanted to plant popcorn. 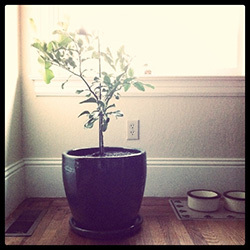 I told him it would never grow but he didn’t listen to me, thank goodness, because it totally grew. I love your pictures. I know that every time I leave a comment here I end up saying the same thing but it’s true, I love your pictures. What a vivid story! I must say I really love the filtering you use on your pics. It gives a certain warmth to them. We had an edible garden when I was a kid. Maybe I’ll have to bring it back now because I remember how fun the whole process was.